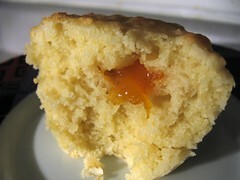 Coconut Peach Muffins - Do You Know The Muffin Man? Notes: These muffins also use the basic baking mix from the book, but add almond flour and coconut. Instead of raspberry preserves (which I did not have), I added a dab of Bonne Maman peach jam in the centre. They are a little crumbly, as expected. Big Al thought they weren't too dry, but I would eat them with additional jam. Oh, I made these using silicon muffin cups placed in a regular muffin tin; I may never go back to using paper liners!